Mobile phones are not the only thing that can deter your concentration from the road. A depletion of negative ions in your car from pollution is another factor which can heavily affect your concentration levels. of negative ions can have on driving and talks about the IONEXAir project, which has the potential to save your life. IONEX delivers environmentally friendly innovation, contributing to the safety of transport and helping to achieve the European transport and mobility goals. The IONEXAir project is the most efficient and innovative IONEX air ioniser for installation in all types of vehicles; it has been developed and tested by the Slovenian company IONEX d.o.o., which has recently been awarded a SME Phase 1 grant. The air inside the cabin of a car is heavily polluted and completely depleted of negative ions. This lack of negative ions arises due to the physics phenomena – a vehicle’s body acts like a faraday cage and, therefore, the negative ions cannot get inside the structure. In addition to this, air conditioning destroys negative ions which would otherwise enter the cabin through ventilation from outside. Living in environments with no or low quantities of negative ions is scientifically proven to be harmful for human health, therefore, they are having to be added to the depleted air artificially by negative ion generators (ionisers). The lack of negative ions causes somnolence, fatigue, slow reactions, loss of concentration and increased irritation. Loss of concentration and fatigue contributes to 17-27% of road crashes, according to the European Commission’s road safety report. Fortunately, we can remedy concentration loss and fatigue simply by adding negative ions back into a car cabin. 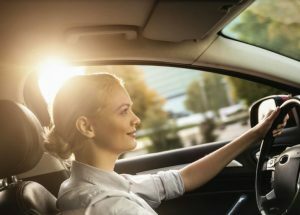 Negative ions – emitted from air ionisers – can prevent these risks by reducing the level of stress hormone, increasing the level of oxygen in your blood, and thus improving the driver’s concentration and contributing to safer driving. The stress hormone is constantly produced while driving. If we lower this, it has been speculated that concentration and driving performance can increase, in turn, the traffic slows and therefore, the number of accidents should decline. 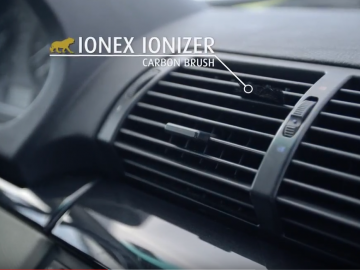 The IONEXAir ioniser adds a sufficient number of negative ions into the car to improve air conditions inside a vehicle’s cabin. The main feature is a uniquely designed and patented carbon brush which emits large amounts of negative ions without ever generating harmful ozone and cleans the air of carcinogenic particles. Negative ions instantly clean the air inside cars by attaching to pollutants and completely removing them. Large quantities of negative ions mean a much more efficient solution than that which current ionisers/ filters can offer. The innovation is significant as it improves the indoor air conditions in all types of vehicles by integrating air ionisation. As a result, the air is completely clean and enriched with remaining negative ions, which have beneficial effects on health as they enter through the lungs into the blood. Subsequently, the level of stress hormone is lowered, whilst enabling the driver to be more focused, alert and careful. Furthermore, prevention of fatigue and sleepiness (by some studies, concentration can be improved by 30%) thus increases safety through fewer accidents. Scientific evidence on the beneficial effects of negative ions for humans has been published by many world-renowned institutes and famous scientists. Many of them have been summarised in the book Negative ions as a method of healing – Evidence by Scientific Institutes Worldwide by ionisation specialist Lorena Leonardos. To protect passengers from constant accumulation of exhaust fumes and soot from traffic in their lungs. “These carcinogenic sub-micrometre particles cannot be stopped by air filters, causing irreversible damage”, explains Mrs Leonardos, the innovator of this solution and the owner of the IONEX company. 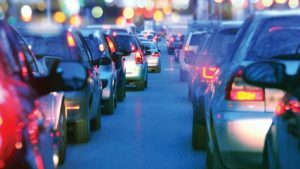 Although electric mobility contributes to lower exhaust fumes, there is still a long way to go to achieve a fume free environment – especially free from diesel engine fumes which emit most carcinogenic particles. As said before, this innovation would come in handy even in a completely fume free environment because its importance is in improving the concentration of the driver, not only air cleanliness and quality. The project is beneficial for final users, especially professional and long-distance drivers, and should be implemented in all cars. By increasing levels of negative ions, IONEXAir automatically creates an environment that is safer, human-friendly, stress-free and healthy. IONEX aims to finalise and commercially deploy this solution throughout the EU and worldwide during Phase 2 and 3. After being successfully awarded an SME Instrument Phase 1 grant, IONEX now intensively works on the pilot implementation. Regarding partnership with potential target customers, a major shift in focus has occurred and we have come to a conclusion that the key target customer should not be the automotive industry, but instead producers of air conditioning and ventilation parts for the automotive industry, which is responsible for introducing such novelties as negative ions to their field. IONEX would like to appeal to all interested potential partners in the heating, ventilation and air conditioning (HVAC) field to conclude a research and development partnership with us. HVAC products, with an incorporated IONEX solution, will achieve a market advantage and improve its competitiveness, as well as improving the air cleaning capacities of current devices. IONEX would like to attract the co-operation of health organisations (IOSH, WHO) to educate the market around the dangers of carcinogenic exhaust gases and solving these issues. This article was published in Government Europa Quarterly in October 2018.